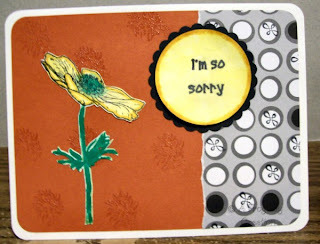 This is also my SBS24 Challenge this week in that we were to make a sympathy card. Lovely card!I also like your flower image. Thanks for playing in the sketch challenge! You won!!!!! I tried to use your email link, but it's broken and gives me an error message -- please email your snail mail address to me at susanna.boyd@gmail.com and I'll get your new Sakura pens in the mail to you!!! Congrats on your win. Cute card. WOW! I guess it has been awhile since I have been here! You have been very busy! This card is sooo pretty! I love that you do not have the flower framed. Lovely!